The only movie theater on Molokai, the Maunaloa Town Cinemas, seen here yesterday, closed Thursday night as a result of the shutdown of Molokai Ranch's properties. MAUNALOA, Molokai » As the last hotel guest checked out and the last putt fell on the 18th hole, teary-eyed Molokai Ranch employees bid farewell to customers and fellow workers yesterday after more than a century in business. "We're like a family," said Marlo Nishimoto, who worked at the hotel for 10 years. "I know a lot of them by their names, and the guests know our employees." The ranch shutdown means the loss of more than 120 jobs and the closure of the island's only movie theater, the only gasoline station in west Molokai, and the island's only 18-hole golf course. The ranch, also known as Molokai Properties Ltd., also shut the doors yesterday at the 22-room Lodge and the 40 tentalows at Kaupoa Beach Village. The Maunaloa Town Cinemas closed to a crowded house Thursday night. Several years of delays in receiving permits for its luxury 200-lot development at La'au in the face of steady opposition was cited by Guoco Leisure, the ranch's Singapore-based parent company, as the reason for closing. Chicago resident Mark Nerud was the last visitor to check out. He said he was sad about the closing and he and his family enjoyed staying at the tentalows at Kaupoa Beach Village. "It's great. You're right on the beach. You can hear the waves all night," Nerud said. Dave Zervas, a New Jersey resident, said he and his wife Gwen's stay at the Lodge was cut short by a day because of closing. But Zervas said the stay was "great" and they would return to visit Molokai. But a number of golfers said they wouldn't be coming back now that the Kaluakoi Golf Course is closed. Karen MacPhail, a Canadian visitor, said the golf course was one of the most beautiful in the world and she didn't understand why the owner would close such a valuable asset. "It's a gem," said MacPhail. "It's just too nice to let go." MacPhail's husband Mal said they stopped coming to Molokai when the golf course shut down in 2001 and only resumed their visits when the course reopened. Mike Jennings, the golf shop manager and pro, said he and his wife are committed to staying on Molokai but he knows the shutdown is going to be tough on people. "There's a lot of people I care about I won't see again," Jennings said. At the Lodge, transportation supervisor Mikee Gomes said he will miss the return visitors. Gomes said families on Molokai are close and support each other by sharing food provided by hunting and fishing. Daphne Socher, the proprietor of the Big Wind Kite Factory in Maunaloa, said she feels sad for teenagers on Molokai who will lose their only theater. "It gives the kids a place to go Friday nights and Saturday nights. They actually have a date place. That will be missed," Socher said. Some laid-off employees are cautiously optimistic about their future. Theater manager Lester Keanini said he's had job offers to work on Maui but he's committed to living on Molokai, where he is having his home built for his family. Keanini's wife was a food server at the Lodge and also lost her job. But she said she's optimistic. Keanini and assistant manager Eric Wong are starting a T-shirt business and talking to investors about opening a movie theater in Kaukanakai. "When one door closes, another door opens," he said. The ranch's cattle operation is expected to be transferred to former livestock manager Jimmy Duvauchelle and his family. Duvauchelle said he'll be leasing some 6,000 acres and purchasing about 800 head of cattle from the ranch. He said he'll keep the operation small and continue to operate the family's Molokai Cowboy Connection dude ranch. "I'm excited. It's something I know I can handle. I know the land. I know the country," said Duvauchelle. Meanwhile, the group Ho'i I Ka Pono, led by the Molokai Community Service Council, said it is trying to raise up to $200 million to try and buy the ranch land. Karen Holt, executive director of the council, said her group has received a $50 million commitment from alternative energy company UPC Wind and also has received other contributions. "There are a lot of people trying to figure out a way to help Molokai," Holt said. "We're not waiting for someone to rescue us. We're trying to rescue ourselves." » 1863: High Chief Lot Kapuaiwa, who later became King Kamehameha V, gains title to the land and begins raising cattle on the land that will become Molokai Ranch. » 1883: Princess Ruth Keliiokalani, who gained title after Kapuaiwa's death, dies and the land passes Princess Bernice Pauahi Bishop. » 1897: A group of Honolulu businessmen purchase 70,000 acres from the trustees of Princess Pauahi's estate and leases another 30,000 acres from the Hawaiian government. American Sugar Co. begins sugar cane production on the lands. » 1908: Charles M. Cooke buys out his other partners and under his son, George P. Cooke, Molokai Ranch raises cattle and also plants sweet potato and wheat crops and produces honey. » 1977: The Kaluakoi Resort opens. » 1978: The Molokai Ranch Wildlife Park offers safari-like tours on ranch lands. » 1986: Brierly Investments, a New Zealand company which later relocates to Singapore, buys the Cooke family's interest in Molokai Ranch and becomes the ranch's sole stockholder in 1987. » 1988: Del Monte shuts down its pineapple plantation on Molokai. » 1996: Molokai Ranch opens luxury campsites where tourists stay in "tentalows." » 1997: The Maunaloa Town Cinemas opens, as well as the Maunaloa General Store, as part of a multimilliion-dollar effort to change the company's focus from cattle to tourism. » 1999: Molokai Ranch opens the $11 million, 22-room Molokai Ranch Lodge. » Jan. 3, 2001: The Kaluakoi Hotel and Golf Club shuts down, leaving 99 people out of work. » December 2001: Molokai ranch buys the 4,100 acres, including the Kaluakoi Golf Course and the 140 room Kaluakoi Hotel. The ranch says it plans to sell 42 house lots and reopen the golf course. » 2004: Molokai Ranch proposes a master plan, which includes development of a luxury subdivision on 500 acres of land at La'au Point, the donation of 26,200 acres of ranch land to a trust for public benefit, and using profit from the La'au Point sale to reopen the Kaluakoi Hotel. » Nov. 16, 2007: Molokai Ranch withdraws its environmental impact statement for the La'au subdivision and master plan before the Land Use Commission in the face of a critical staff report. » Dec. 26, 2007: The Hawaii Supreme Court rules a permit issued by the state Commission on Water Management that allows Molokai Ranch to take 1 million gallons of water a day from the ranch's well 17, is invalid. The ranch provides water to the golf course, an industrial park, beach lots, condos and Maunaloa town. » March 24: Molokai Ranch says it will close its operations and lay off more than 120 workers. » Yesterday: Molokai Ranch closes the Molokai Lodge, Kaupoa Beach Village, Kaluakoi Golf Course, Maunaloa gas station, cattle-rearing and maintenance operations. 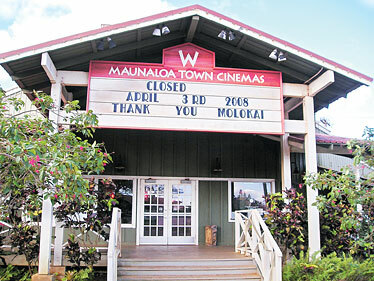 The Maunaloa Town Cinemas closed two days earlier.